If you visited the Gmail log-in page recently or on today, you may have noticed that Gmail Front Page looked a bit different. 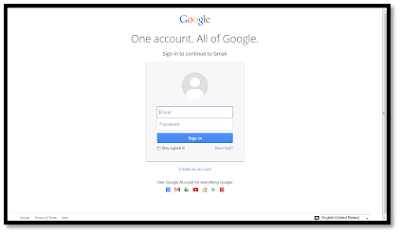 Actually Google has rolled out their new Gmail HomePage interface which they were testing from last few months to comprehend their new theme tag line "One account. All of Google"
Finally they rolled it out today and the old Gmail interface is gone forever. I saw it just now a few minutes ago and decided to blog about Gmail HomePage Makeover for this year. I liked the new Gmail Login Page "One Google Account for everything Google", What you think of this new layout? Share your view's in the comment box below.